Walkability is so popular in urban planning conversations that it risks becoming a buzzword without meaning. A food stand on the sidewalk – meeting daily necessities. And inviting. 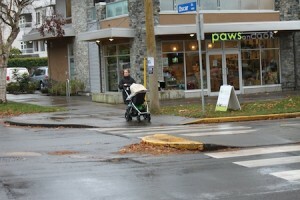 Have you seen an urban plan recently that didn’t make at least token reference to walkability? Walkability is also becoming a marketing feature, especially in real estate sales. Realtors are jumping on the bandwagon with ads touting their properties as being in walkable locations. 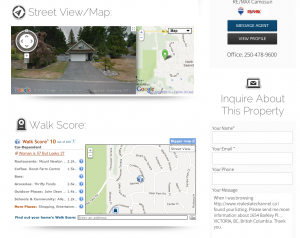 Too often, however, those real estate listings are just pulling up a Walk Score – the online measurement tool. It’s a convenient selling point to boast that a location has a walk score of 92 or such. Walk Score is a useful measure but it only takes us so far. As the good people at Walk Score point out on their own site, there are many things it doesn’t do. Locations with a high Walk Score may in fact be dreadful places to walk – places with missing sidewalks, crime problems, a stream of noisy diesel semi-trailors blowing past your shoulder and an utter lack of any comforting natural features. If we are going to use the word walkability, let’s use it to describe places where people actually want to walk, and do walk. It’s not easy to “score” true walkability but it is possible to describe it. Proximity. Live, work, play, learn – all within 15-20 minutes’ walk of one another. Density Driven Diversity. OK, I’m using an alliterative phrase to jam a couple ideas together here. Population density is almost always necessary for walkability, simply because density drives the diversity we look for in #1, above. Infrastructure. Sidewalks. Ramped curb cut-outs for wheeled access. Street crossings. Basic stuff, right? But the difference between good, bad and ugly walking experiences is often in the quality of the infrastructure. Pleasant Stimulation. Being mugged is stimulating but not pleasant. So to be pleasantly stimulating a walk environment first has to be safe (from rushing trucks at curbside or idle vandals looking for someone to bully). Then we need to add appeals to the senses – sights, sounds, smells, and tactile sensations that are positive rather than negative. Many of these characteristics are hard to quantify – they are inherently subjective. Which is how it should be. With walking, we are talking about humans. We are a diverse species with complex interests and needs. My personal experience with walkability is unique to me but I do fit into a demographic that is often mentioned in urban planning – the empty nester who downsizes and moves from a suburban to a more urban setting. My wife and I did just that in recent years, leaving the large house in a suburban neighbourhood for a condo (in a different city) closer to more of what we enjoy in our lives. My home in Victoria, BC, Canada earns an 82 Walk Score. Subjectively, I would rate it even higher. In just 5 minutes I can walk to Cook St. Village, a classic mixed-use cluster of shops, services and residences where I can do most of what a person needs to do in course of daily life. Buy groceries, pick up a prescription, have a coffee, do some banking. A similar distance in the opposite direction lies a community centre, school, and (a bit further, over a small hill) a strip mall with more stores. There are a number of churches nearby. Victoria’s downtown (where my most frequent destinations are the library, bookstores and the YMCA) is within the 15-20 minute range as well. Scenic waterfront destinations are also within range, as are a number of urban parks. Distance matters. Curb cuts matter. I can and do walk much further at times, setting out on journeys that link multiple destinations and (stops included) might run into the hours instead of minutes. But for practical purposes, most of us hesitate to walk to daily activities if the walk is likely to take more than 20 minutes one-way, especially if it involves us carrying stuff to and from the destination. Density Driven Diversity. Diversity makes a neighbourhood both functional and interesting for people on foot. Density drives that diversity because population density ensures there is a market for diverse retail, social, educational and other options. I speak here not just about diverse demographics. What is often overlooked is that we each, individually, have diverse needs. Most of us don’t eat the same thing every day, 365 days a year. Want a pizza? What kind? There are times when I’m at the end of long day and want a quick, greasy, stomach filling slice of pizza. The little pizza shop in Cook St. Village that sells pizza to go by the slice is just right on those days. On other days, we might want to take visitors out to a boutique thin crust pizzeria with wood burning ovens and a significant wine list. That restaurant is about three minutes away from the takeout place. Similarly with groceries, there are times we need to stock up on basics. 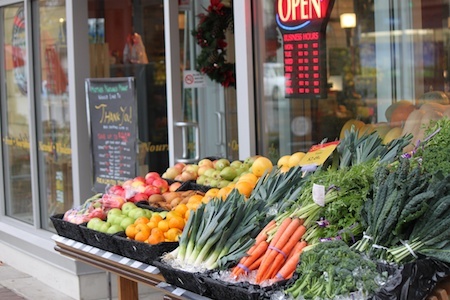 Times we are looking for the freshest local organic produce. 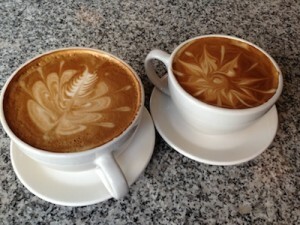 Times we just need to grab cream for the coffee. 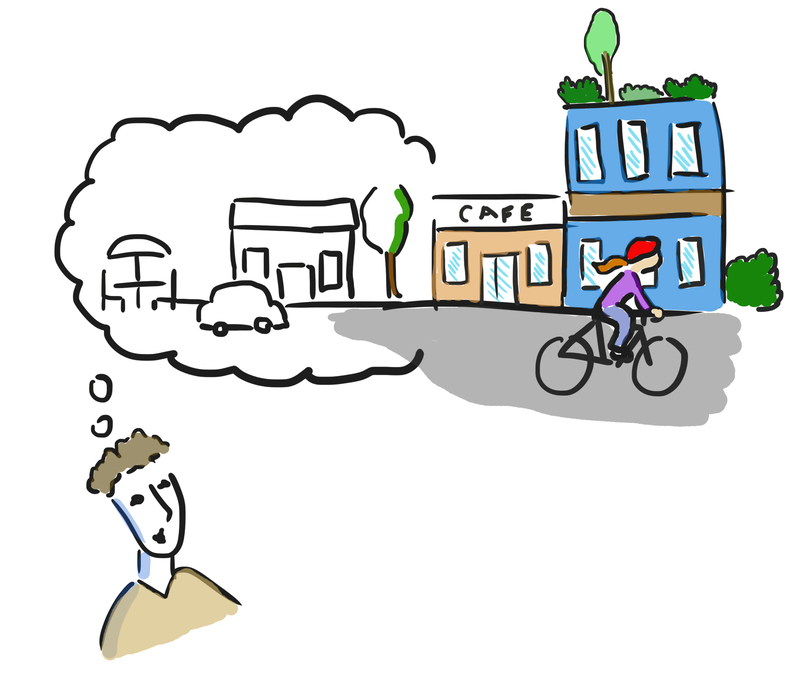 A walkable place has sufficient diversity to meet our needs in all these situations. Density drives that diversity. Our neighbourhood features a number of small boutique shops – one just carrying designer rain wear (we do live on the edge of a rainforest) – serving a niche market. The city needs enough population density to support those niche retailers. Of course, the more such unique stores can thrive, the more they in turn create the ambience that people want. The street becomes diverse and interesting – a destination – for more and more people. The Walk Score where we lived in my former home town was 58. Low, for sure, but I thought it would have been even lower. When I looked at the Walk Score map I saw that yes, we did lived within five minutes of a few services – but who wants to shop at a convenience store attached to a gas station? The one nearby restaurant was a fried fish place and I don’t eat fish. We walked a lot, for recreation, in the gorgeous nearby river valley parks system. But “walkability” requires the stuff of daily life, in close proximity. Infrastructure. On the suburban-style roadways of my former home city, some main arterials had sidewalks that leap-frogged from one side of the arterial to the other, as if walkers don’t care for just picking one side of the street and staying there. Some cities are notorious for the gaps in their sidewalk networks. 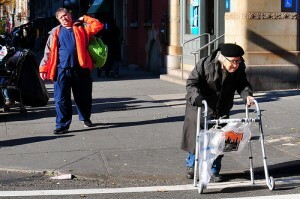 Missing links severely weaken walkability – an athletic 20 year old will tromp over a rough patch here and there without much worry but that same patch will totally stop an elderly person walking with a cane. 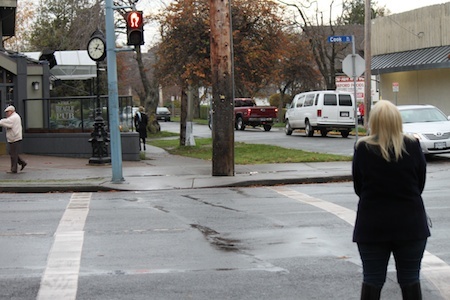 A common sight – pedestrian waits for cars and the light. So walking infrastructure is key. Sidewalks on both sides of every street. Curb cuts and ramps so that someone in a wheelchair or pushing a walker or stroller can navigate with ease and comfort. Wide enough walkways for people to pass one another. 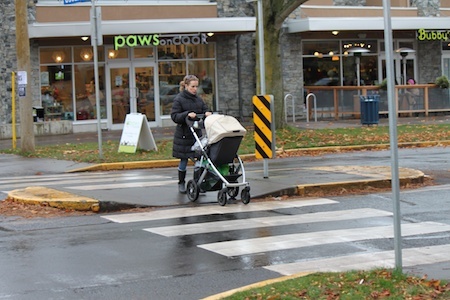 Frequent street crossings that give pedestrians real power. What is power for pedestrians? Control and priority. Control might mean pedestrian activated crossing lights. But nuances are important. On Cook Street in Cook St. Village, for example, there are three crossings in a short distance – and the one with pedestrian activated lights is my least favourite. Why? Because I have to wait. Cars have the power until the light changes. Checking for traffic at a crossing that gives pedestrians priority. In the other two crossings, I can step one stride off the curb and make eye contact and drivers (most of the time) recognize that they need to slow or stop. I cross on my timeline. Each of the two “uncontrolled” crossings is clearly marked but one goes even further to serve pedestrians, with prominent bulbs that narrow the driving lane and an “island” in the middle of the street. The crossing distance for each lane is very short (a few strides for most people) and the island provides a protective space to pause half way – so even if a car doesn’t give you the right-of-way, you can stop half way and let the jerk drive through. That is a very rare occurrence. A lush boulevard of trees on both sides, a little vehicular congestion, and streams of people on foot create an environment where it is clear to any reasonable driver that this is not the territory of cars. Of course, the configuration of streets themselves has a huge impact on walkability: the width of streets (narrow is better), the length of blocks (short is better) and the way that the streets intersect. Part of the magic of Cook St. Village as a pedestrian area, for example, is due to the fact that streets intersecting with Cook all come to a T intersection – with no through streets. The difference is subtle but significant – all traffic from side streets come to the modestly congested Cook and must turn (without aid of a traffic signal). Vehicle traffic is therefore slow and pedestrians can amble across the side streets without worry about through traffic. Those kind of big infrastructure elements can’t be retrofitted to a neighbourhood but they are important to keep in mind when we are trying to design new walkable neighbourhoods. Pleasant Stimulation. A neighbourhood must invite you out into the street to be considered truly walkable. Safety – from vehicles (still our society’s biggest killer) – and from personal assault are a given. We each have a cultural and personal sense of what is safe and what is not – in a walkable place, that sense of comfort is just there – we rarely have to think about it. Beyond that, what’s of interest at eye level, at a walking pace, on your routes through the community? Interesting homes and yards. Creative and unique retailers. A canopy of trees is comforting. Sidewalk cafes and patios are popular in my ‘village’ – people just naturally enjoy watching other people, petting their own or others’ dogs and cats, or enjoying the breeze through the trees on the boulevard. The boulevard is a significant element of infrastructure design, providing a natural buffer between the sidewalk ‘ballet’ as Jane Jacobs called it and the vehicular traffic on the street. A walkability essential for this writer. To be stimulating, a street or neighbourhood needs to be somewhat dynamic. Of course, the transitions of seasons provides some of that, as we enjoy watching the cycles of growth. 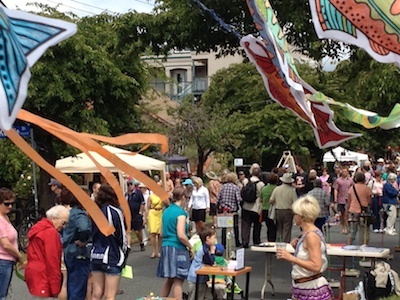 Summer street festivals build community and give people a neighbourhood sense of ownership of their streets. Within five minutes of home, I can enjoy a Saturday morning market of local growers and a summer art festival. A couple times a year, local artists sponsor studio tours in the neighbourhood and we learn what creative wonders are created in those houses we pass every day. Art walk on neighbourhood street, Victoria BC. Historic character and diversity in the buildings of a neighbourhood create interest and ambience on a street. Not every street has that, of course, but cities can encourage diversity through their design guidelines. Four Keys and a Caveat There are, of course, other elements to creating an entirely walkable city. Looking at the broader context, we need to examine factors such as transit and cycling connections, knowing that none of us live wholly within one neighbourhood. There are many great walkability resources out there. 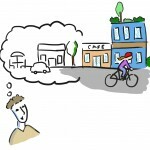 Urban blogger Steve Mouzon has some great commentaries about urban design. Sites like walk21.com, walkinginfo.org, mayorswellnesscampaign.org, ceosforcities.org, Project for Pubic Spaces and canadawalks.ca are just a few providing design tips, tools and guides for professionals and community activists. And I need to get my hands on the new book The Walkable City, which sounds promising. Plus of course the Walk Score tool itself is of value, if we use it as a starting point for assessing walkability, not the end point. Walk Score has made great strides in bringing walkability to the attention of realtors and, through them, buyers and sellers. The most important characteristic that makes a space walkable to me is public benches. I have COPD and it’s very important for me to get out and walk. I must sit and recover at least once or twice a block. This means no walking along Dallas Road or the Breakwater – too much space between the benches. I would love to take walks in my neighbourhood – but I can’ make it from one bus stop to the next. I used to shop at Zellers at Tillicum, because they had benches every few aisles. I can no longer stroll in large stores. I need to go in get what I want and come right out. I get most of my walking done in malls. I’d love to walk outdoors – but it’s not very walkable to me. In case you think I’m just a special case, I know a lot of us are out there. We just become very good a hiding our need to sit down and do a lot of leaning. Excellent point. More benches is something that local businesses, community associations and city governments can and should collaborate on. For a brief, golden period, I lived in a neighborhood where just about everything I needed was within 10 minutes: big bank, small bank, credit union; Safeway, Trader Joe’s, independent market; health club and Yoga/Pilates studio; veterinary hospital; library; hardware store; Starbucks, Peet’s, mom-and-pop-run franchise cafe, funky independent cafe; antique store; wine bar, tavern, semi-fancy restaurant with cocktail bar; two dental offices. Department stores and such were a twenty-minute bus ride away. The neighborhood also contained several public and private schools, two Catholic Churches, a Protestant church, and a local Jewish meetup group. This was HEAVEN! I worked from home and never had to leave my neighborhood – unless of course I wanted to go somewhere. Assuming that a person can work and sleep in the same area – after that, the most important aspect would be a grocery store. Following those things for most people I would imagine the following three: coffee, restaurants and bars. After that you need public transportation availability. Following that you add the other things that make life fuller: A gym, a library, bookstores, post office, a hardware store, a movie theater..professional offices and finally retail. For most people all of this dream is broken because they can’t live near where they work for a variety of reasons. If you own your own business you have more flexibility. I’m getting ready to make the plunge to a walk-able community and I can’t wait.